Dancing Bear Lodge is perfect for company retreats, family reunions, or just relaxing with a large group of friends. This luxury vacation rental is a spacious, custom-built 3,300 square foot home featuring an open beam design. The property features a main house (2200 square feet), which is separated by a breezeway from a second building that we like to refer to as the 'Bonus Area' (1100 square feet). The main house features four bedrooms and two bathrooms. Three of the bedrooms have king-size beds which can be split into twins; and the fourth bedroom has a twin loft bunk bed set. The large upstairs family room has a Foosball table, TV, DVD player, and Xbox 360 as well as three queen-size futons with memory foam mattresses. We can prepare these as beds upon request. A fully equipped kitchen, dining room, and living room with TV/DVD player and wood stove (firewood provided) are located on the first level in the main house. The main house is included with every reservation. The Bonus Area houses a great room with a pool table, TV/DVD entertainment center, and a kitchenette. This building also has 2 bedrooms, both with king-size beds that can be split; and a 3/4 bathroom with rain shower. The Bonus Area is included in the nightly rate for groups of 12 people or more. For smaller groups who wish to spread out, the Bonus Area is available to rent for a $100 flat fee for any length of stay. With the Bonus Area included, this home can comfortably accommodate up to 18 people in beds. Upon request, we can provide 2 queen-size blow-up mattresses and the necessary bedding for additional guests for use in the Bonus Area. Dancing Bear Lodge provides a wrap-around deck with a stainless steel BBQ. It also offers an outdoor hot tub and a large fire pit for that is ideal for roasting marshmallows. There is a wooden play structure for kids to enjoy and a grassy lawn that is perfect for yard games. For those of you who love a good morning, we recommend a hearty breakfast of Belgian waffles. We provide a waffle maker, Belgian waffle mix, syrup, coffee, and hot cocoa. Additionally, the kitchen is stocked with dishware, cookware, bakeware, and utensils. We also provide cooking oil and spices for meal preparation. 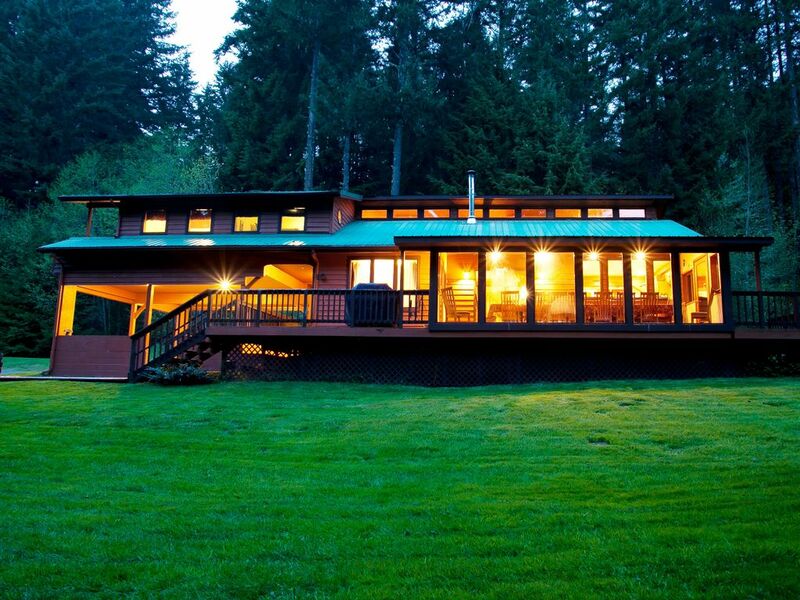 Three Bears Cabins is a property management company that owns and manages cabins located at the base of Mount Rainier. The company is run by Kevin and Melissa Harwood, and employs a full staff to ensure that the cabins are clean and well maintained.. Since acquiring their first rental property in 2005, Three Bears Cabins has continued to grow by providing incredible guest experiences. Each experience offers well appointed cabins, a variety of amenities and comforts, and outstanding customer service. The town of Ashford sits at the base of Mt Rainier. The large dining room seats 16, and there are three bar stools for additional seating at the adjacent kitchen counter. The Bonus Area included a pool table and TV/DVD player. The property is situated on 2 private acres with a large lawn, perfect for outdoor games in the summer or snowy fun in the winter. This place was beyond beautiful! It was huge and had all the feels of a cabin in the woods. The rooms were great and I love the loft upstairs that has a little look-out area above the kitchen. Having the bonus room was a great addition as most of my party loves to play pool. There were so many places to sleep and I was relieved to see there were extra blankets too. The family room upstairs was a fun place to play jenga. So spacious! We didn't get to utilize the little balcony upstairs too much because it was raining all week. I love how there are so many windows so we could all wake up to seeing the trees and grass. The hot tub was really nice to just relax in. There's something about the combination of rain and hot tub that makes it that much better. We're thinking of making this cabin my annual birthday getaway. It was so much fun! Dancing Bear Lodge was amazing! So perfect for our family gathering. The game room saved the day as the late night crowd didn't impact the early to bed crowd- Fabulous! We were disappointed that Mt. Rainier was closed, but we were able to save the day and headed up to White Pass for sledding and skiing. The cabin is stocked with everything you need and then some. Hope to be back in summer! Wonderful place. The pictures and description do not do it justice. Wonderful place. The pictures and description do not do it justice. They thought of all the little details. Perfect for entertaining children. The woodwork throughout the interior of the home is amazing. We loved this property! 8 women (we were intending on 10 of us) stayed for 3 nights to hike on Mt. Rainier. The location was perfect, nestled in the woods, less than 10 miles from the park entrance. We have been renting accommodations in the PNW for the last 10 years to work for our hikes and up to 12 of us to comfortably chat, prepare meals, play games and sleep. It met all of our needs! We found the lovely woodsy home warm and inviting and very well organized. Probably the most organized we have stayed in. Someone had spent time with attention to detail which help make it special and easy to live in. Coffee, waffles and all the necessary accompaniments were provided. Most of us hope to make this an annual location for Hiker Babes to gather! Many thanks to the owners, organizers, and cleaners! INCREDIBLE EXPERIENCE! This was one of the best vacations I've ever had and I have Rainier Lodging/Three Bears Lodge to thank for it! This is an excellent house for large groups. It only missed an excellent rating because the living room was rather small and it had a "somewhat inaccessible" bedroom upstairs. The dining area and table were great, but the living room was too small for a large group to congregate. The upstairs bedroom is only accessible through the upstairs bathroom. If someone is in the bathroom you are stuck in the bedroom until they are finished. All in all, this is a great house and we would rent it again in a heartbeat. p.s., no pets, even well behaved pets. Swim and fish in the local lakes, hike natural wooded trails, identify meadow wildflowers, or just snap some photos and enjoy the wildlife. Go mountain climbing, take in the glaciers, waterfalls, and old growth forests. In the fall, view the spectacular autumn colors. During the winter, take guided snowshoe or cross country skiing tours with the park rangers, rent snowmobiles or bring up your sleds. Nearby attractions include Mt. Rainier Scenic Railroad, Northwest Trek Wildlife Park, Recycled Spirits of Iron Sculpture Garden, EZ Times Outfitters Horseback Rides, and boating and fishing at Alder or Mineral Lake. Rates are subject to change until reservation is confirmed. 2-night minimum stay required on weekends (Fri/Sat must be booked together). 3-night minimum stay required over Federal Holiday weekends (Fri-Sun): Martin Luther King Jr. Day - January 12, 13, and 14 @ $510/nt for 8 guests. President's Day - February 16, 17, and 18 @ $510/nt for 8 guests. Memorial Day - May 25, 26, and 27 @ $510/nt for 8 guests. Labor Day - August 31, September 1st, and 2nd @ $510/nt for 8 guests. 3-night minimum stay during Peak Winter Season: December 16, 2018 - January 5,2019 4-night minimum during Thanksgiving Holiday: November 21-25, 2018 Bonus Room is included for groups of 12 or more and an extra $100 for smaller groups that want the extra space.